OXFORD, Ohio – Very few 6-feet, 6-inch skaters end up as high-level forwards in hockey. Manning left or right wing requires a certain level of speed and athleticism players that size often lack. 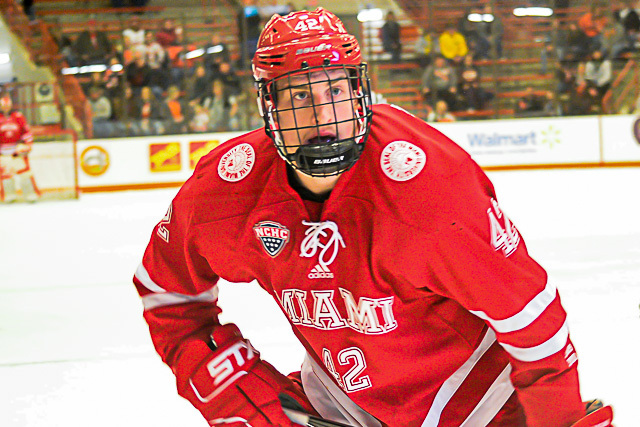 But in 2014, left wing Conor Lemirande pounced on the opportunity to fill that role with Miami alongside his cousin, Andrew Schmit. And Lemirande has thrived as a grinder with the RedHawks since, dressing for 133 games and loving every shift. 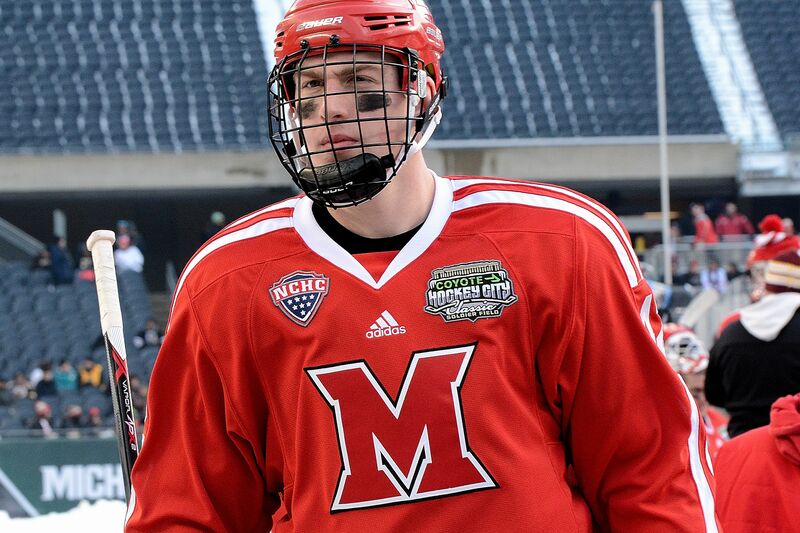 Conor Lemirande at the outdoor game at Soldier Field (photo by Cathy Lachmann/BoB). The duo was informally nicknamed the Crash Cousins for Lemirande’s first two seasons, and at a combined weight of 500 pounds, that tandem often comprised two-thirds of Miami’s fourth line. Size is a family tradition in Lemirande’s extended family, which is from Janesville, Wis. His father, Jeff, refers to himself as one of the smaller males in the clan at about 6-5. Lemirande’s brother Logan is also in that height range. Schmit is 6-5, about the same height as his father, Robb. Lemirande started hockey around age four, and he played baseball through eighth grade and football – a family staple – until his junior year. With his girth, the temptation was there for at least one coach to try him on defense early in his career. He spent two seasons at in-state Madison on Under-16 and Under-18 teams before signing with the hometown Janesville Jets of the NAHL prior to 2011-12. Lemirande logged 110 games over two seasons there, becoming team captain and tallying 32 points. He played against his brother, Logan, who was on Port Huron in the same league. 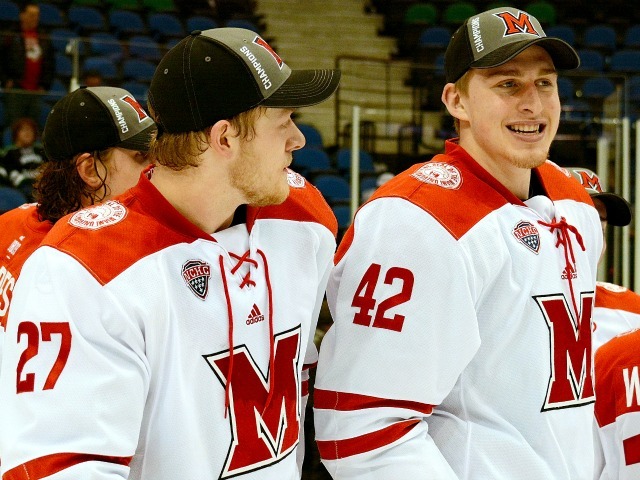 Scott Dornbrock and Conor Lemirande celebrate an NCHC Tournament win in 2014-15 (photo by Cathy Lachmann/BoB). He was drafted in the USHL his second year at Janesville and ended up in Youngstown, where he scored seven goals and picked up 10 assists in 58 games. From there it was south to Oxford, where Lemirande dressed for opening night of 2014-15, nine days after his 21st birthday. He was in the lineup for the team’s first 23 games and 36 overall that season, which culminated in an NCHC Tournament championship and NCAA berth. Lemirande’s lone goal that season came vs. Notre Dame in a Florida tournament, but as a sophomore, he would log the offensive game of his career. 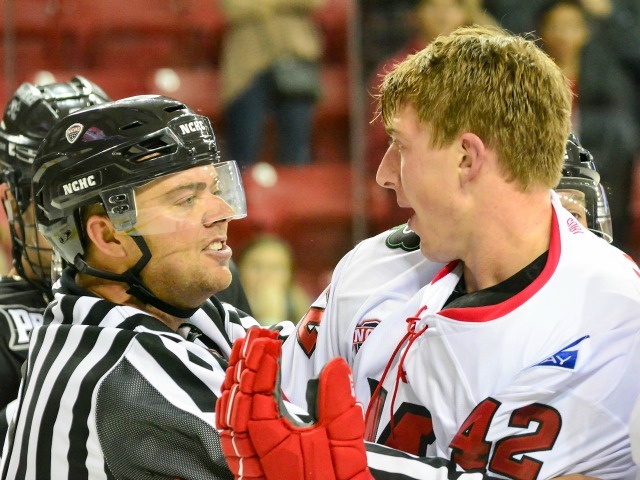 In a Jan. 23, 2016 contest at Nebraska-Omaha, Lemirande slammed home a loose puck with four minutes left in the first period to give the RedHawks a 1-0 lead. Miami was up 3-1 midway through the second period when Lemirande again found the net, this time banging home a centering feed by Alex Gacek. Just over three minutes later, he scored again on a double deflection that was also redirected by Schmit. That completed the hat trick – including the game winner – with Schmit picking up primary assists on two of the goals. Conor Lemirande celebrates a goal his junior season (photo by Cathy Lachmann/BoB). That was the last three-goal game recorded by a Miamian. Lemirande was limited to a goal and an assist his junior season, but his 2017-18 line is 1-4-5, already a career high in helpers and points. Of those helpers, two came in a win at Bowling Green on Nov. 24, his only career multi-assist contest. Captain and senior defenseman Louie Belpedio roomed with Lemirande freshman year and currently lives across the hall from him. Conor Lemirande as a senior (photo by BoB). For his career, Lemirande has scored six times and set up eight more scores, but most of his contributions do not appear on a scoresheet. Lemirande has also gained additional minutes as he has been added to a penalty killing role this season. Conor Lemirande cuts down a Bowling Green player his senior year (photo by Cathy Lachmann/BoB). Forwards at his size are unusual enough, but it’s even less common to see 250-pounders up front when their teams are shorthanded because four skaters have to defend five on the PK. His additional ice time on the PK is a direct result of his overall evolution on the ice. Defenseman Scott Dornbrock has played with Lemirande for four years and has also been his roommate the entire time the pair has been in Oxford. As in any sport, more versatility equals more playing time. “(I’m) working every day to be who I am to give my best to being that physical presence, be that guy that can be relied upon and trusted in different situations,” Lemirande said. As a defenseman, Dornbrock frequently battles with Lemirande in practice. Through that experience, Dornbrock has learned how to handle the giant on skates in 1-on-1 battles. Conor Lemirande talks to an official (photo by Cathy Lachmann/BoB). Lemirande’s positivity at the rink is another tangible attribute, Belpedio said, and his attitude is infectious. And Lemirande’s personality extends off the ice. Lemirande’s last two homes games will be this weekend, and he is set to graduate in May. He has a 3.4 grade-point average, earning him All-NCHC Academic honors this season, and he is majoring in sports management. Lemirande has already completed his core classes and is down to electives. 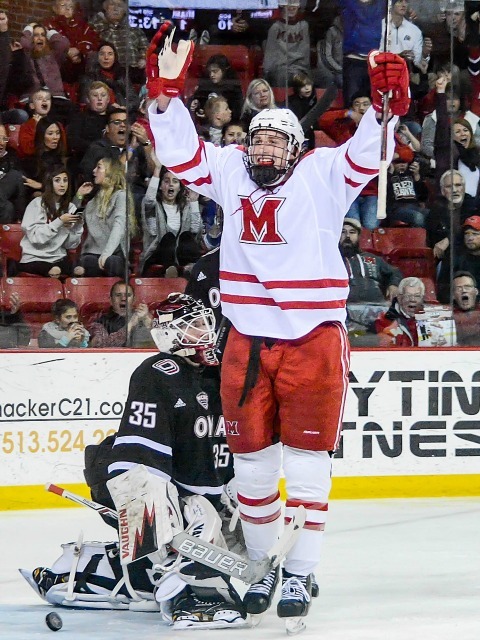 Posted on February 22, 2018, in 2017-18, Uncategorized and tagged 2017-18 miami redhawks, Conor Lemirande, Louie Belpedio, Scott Dornbrock. Bookmark the permalink. Leave a comment.